Unbroken is a beautifully told true story of Louis ‘Louie’ Zamperini’s incredible life and his trials in overcoming the adversity of poverty; racial discrimination, surviving 47 days at sea on a life raft, as a prisoner at a Japanese POW camp and a coal mine; and according to friends of mine who’ve read the book – that’s only part of it! Played with compassion by Jack O’Connell, (Starred Up) the tale of Louie opens a portal to a time that our ancestors knew so well but that some of our forever scrolling, individualist culture forgets. These young, strong, handsome and ambitious men put their bodies on the line moment to moment for what they believed was right. Often the honour of survival was their medal; and first time director Angelina Jolie takes great care to lovingly create a nostalgic and pretty even handed account of both sides of the WWII conflict. For goodness sake, these strapping lads sped through the air in metal behemoths trusting in each other as they couldn’t always count on their equipment or that their officer’s orders where in consideration of their well being. There’s a possibility when viewing our collective human history to overlay an innocence or noble naivety on top of citizens of the past, when viewed from our ‘aware’ modernity…but Jolie steers clear of this too. 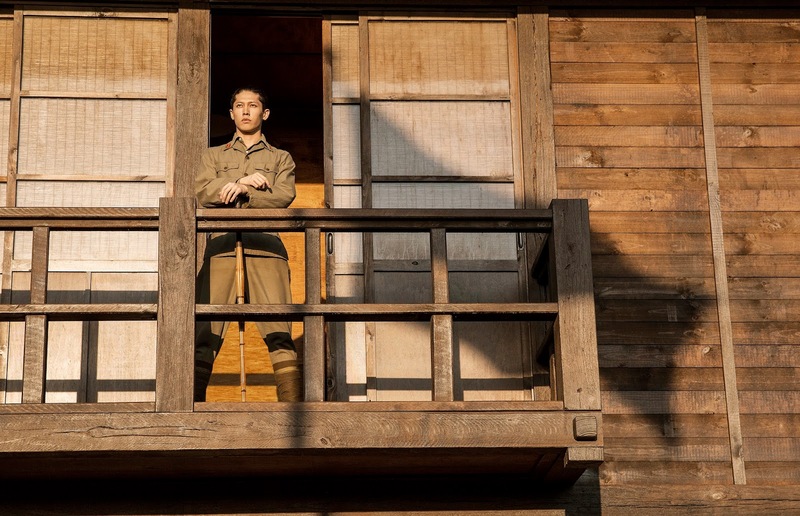 Reminiscent of the Speilberg masterpiece Empire of the Sun; real portrayals occur here, where not everyone is good, not even all the evil is truly evil; case in point, the sadistic man child ‘The Bird’ played formidably by Takamasa Ishihara or Miyavi in his first English speaking role. Domhnall Gleeson (About Time, Frank), Jai Courtney (The Water Diviner, Divergent) and Alex Russell (Chronicle, Carrie) also turn in measured performances allowing the shock of the true events to thrill for themselves. Of course all these fine actors march to the beats of an excellent screenplay by The Cohen Brothers. Mysterious and sadistic, this Bird (Ishihara) won’t let you fly the coop. Academic Area: Nostalgia. It’s a pretty straight forward academic area this review: everyone who’s anyone has felt nostalgic themselves – whether looking at old family photos or throwing on an album of music to enjoy that you haven’t listened to in years. In Unbroken however, director Jolie pulls you into the little quirks and nuances of a time when ‘that’s just how it was back then’. Each time Zamperini’s family gather around the wireless to hear how their Louis was doing, we swell with emotion and the realisation that – that’s it. Miss the announcement and that moment of celebration is lost forever. Become separated from your best friend in a conflicted, foreign land – and there’s every chance you’ll never see them again. How children played and what with, the realities of cooking and homemaking for Mama Zamperini and that for the majority, life was tough and without frivolous disposable income. And all of this nostalgia has an intended effect; to induce us to feel grateful for the lives we have, the sacrifices made by others on our behalves and that we should strive to work together as a human race to not allow ourselves to waste our youth in the spoils of war. Gorgeous shots, an epic ride through recent history, giving understanding and screen time to the catalysts of world governmental grudges…Unbroken is sobering and must see cinema for 2015. Are you looking forward to seeing Unbroken? Let me know on Facebook on in the comments below. “Never give up, no matter what” – Louis Zamperini as played by Jack O’Connell. PITCH PERFECT 2 EPIC PRIZE PACK Competition!